Managing regulatory risk for a large corporation is not easy. With rapid change occurring in nearly every country, the regulatory landscape is a vast and an uneven one. With new machinery, staff and expansions, staying on top of your requirements is a big challenge. With Nimonik, you can ensure your global operations are up-to-date on their compliance obligations. With our expansive regulatory database you get an accurate portrait of all the laws and regulations that apply to your business, across all geographic locations. Our in-house regulatory analysts track your applicable legislation and standards with a keen eye and notify you of the changes within 2 days of publication. With Nimonik you can easily meet and maintain compliance requirements for ISO certifications like 14001, 50001, or 45001. Receive an up-to-date list of documents, laws, and standards applicable to your operations or a gap analysis of your existing list of documents. Organize legal information efficiently by jurisdiction, type of document, business activity, equipment, or industry. Understand regulations with simple summaries provided by our expert analysts. Access the source material of regulations at all times. Receive alerts to review changes shortly after government publication. You and your team receive full training and support every step of the way. Build a complete record of your compliance efforts to use during an audit or a management review. Join the world's EHS leaders by analyzing and tracking compliance at the most granular level with Nimonik's premium compliance management, Clause - Level Compliance Obligations. Your IT department cares about your data security and so do we. We use encrypted communication, strong password systems and regularly test our systems with Penetration tests and other security measures. We are also in the process of getting ISO 27001 certified. 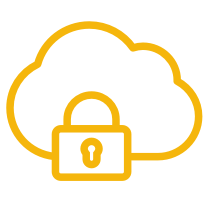 Although you can easily integrate Nimonik's regulatory data into your existing EHS Management or ERP software like SAP and Oracle, we have you covered if you don't have a system in place. Nimonik App helps you keep your data organized and accessible at the click of a button. Its easy-to-use interface ensures that your team easily adopts and uses the software so you can collaborate better and always stay on top of the things. Tracking applicable regulations is imperative to managing risk. You can do it in-house but it has obvious challenges of staffing, quality control, and turnover. Not to mention the challenges of centralizing information for collaboration and maintaining records. You can subscribe to newsletters and updates by law firms but they are rarely ever comprehensive, covering just the largest and the most significant changes. Costs can quickly spiral out of control for tailored updates. Regardless, you still face the issue of transforming data to actionable information. 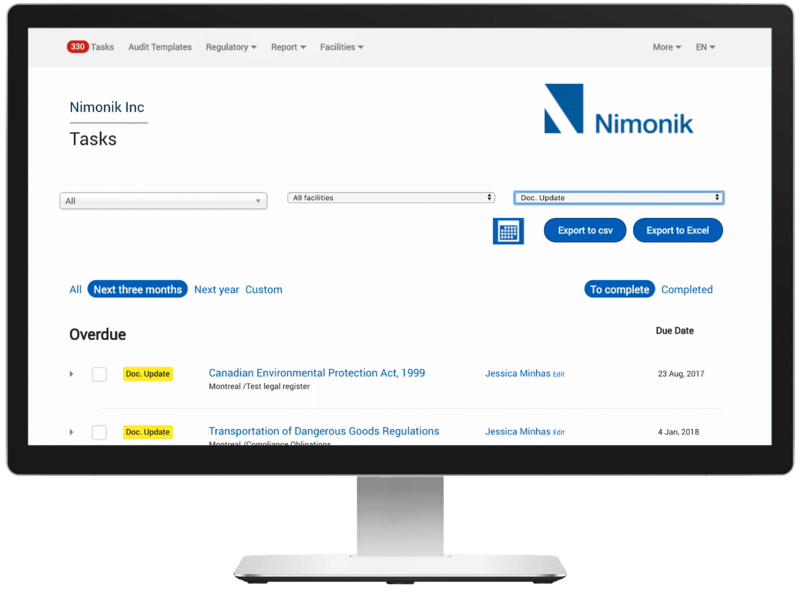 Nimonik tracks all your applicable legislation, standards, codes, and statues, and provides you with the information in a consistent format. You can choose to easily feed it into your ERP system or use it on our easy-to-use NimonikApp. With Nimonik, everyone in your team has access to the right information, at all times. Information that is easy to understand and actionable. ​– Charles l’Ecuyer, Transcontinental Inc. Most auditing tools on the market are either too complex or too basic. Nimonik's functionality and its easy to use interface ensure that your front-line personnel easily adopt the tool and bring the results you expect. With Nimonik, getting approval from the IT department is a breeze as we take data security seriously and are in the process of getting ISO 27001 certified.